This setup is impressive to me. It spools fast, it makes good power even on limited octane fuel, and has a very useful powerband for the street to enjoy the car on. I'll let the owner be aware of this post, and if he wants to share some pics of his car he can do so. great power curve and that's a pretty nice spool. Thanks yet again for tuning my ride. I was pushing 521 before with stock head and had my valve seals leak. Sent it to BR. Contacted Tom for another refresh tune and it is beyond my expectations. The first flash it felt good. He sent another flash and set it up. I started it up and went to do a pull. I'll be honest, first pull scared the crap out of me. I thought I bent the steering wheel from it pulling so hard. He goes above and beyond everytime. Thanks again for getting it where it is now. This all was accomplished with 2 flashes, that's it. The intake manifold is stock, only thing done is egr delete. wow nice. 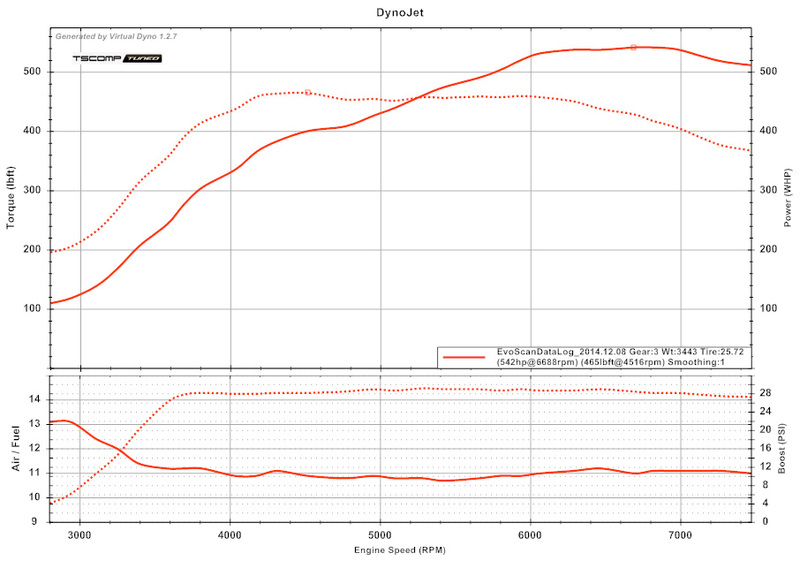 spool for the black is very nice on the 2.3. im sure on a stock 2.0L it will reach max boost around 4.5k'sh? Nice. Congrats man. That's impressive spool and power. Its on pump gas no less too. Thanks everyone. Glad you're happy with it Chris! The S2 cams are allowing it to spool really fast.